I got this delicious Paleo Double Chocolate Chip Cookie recipe from Paleofeet but I changed it a little. I dolloped the cookies onto the baking tray thinking they would flatten but they stayed as balls but I like them. They are fun to eat and lovely and moist in the centre. 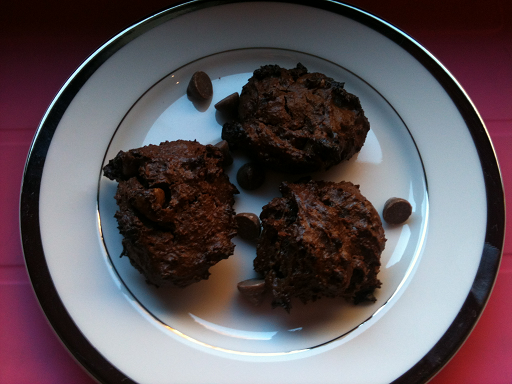 I really love the honey flavour that comes through in these Paleo Double Chocolate Chip Cookies. It is so easy to make you own almond butter. Just follow my instructions on how to make peanut butter and substitute the peanuts for almonds. Home made is always better than store bought and this is so easy. It's wonderful to eat such natural, wholesome delicious food. Enjoy. Heat oven to 180C and line baking sheets with baking paper. Mix dry ingredients leaving out the chocolate chips. Mix the wet ingredients in a food processor or by hand in a small bowl. Combine the dry and wet ingredients until well incorporated. Add chocolate chips. Spoon heaped teaspoons onto a lined baking tray and bake for 10 - 13 minutes. Keep an eye on them between these times as they do burn quickly. -The cookies do not flatten as they cook they stay as is. So if you want the cookies to look store bought flatten them. -When making home made almond butter I find you need to double the ingredients, for example to make 1/4 cup you need to use 1/2 cup of almonds. 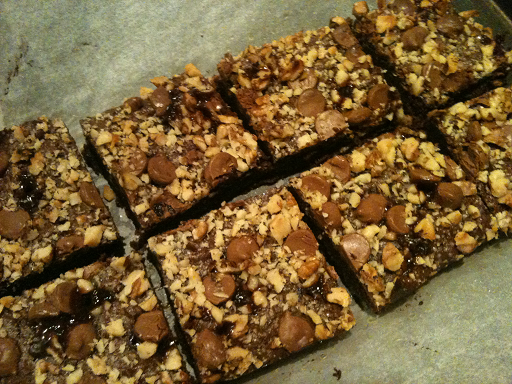 Chocolate Nut Fudge Brownie fresh out of the oven. Oh the aromas! 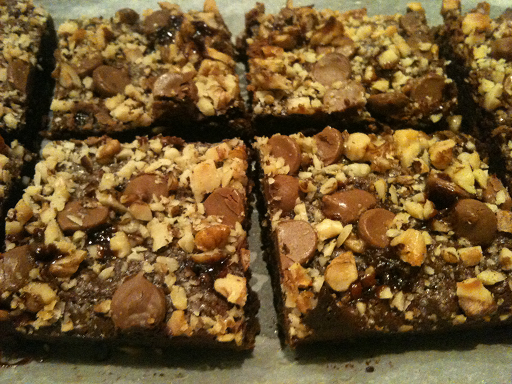 I wanted a quick and easy dessert to cook and found this Chocolate Nut Fudge Brownie on Health Bent one of my favourite recipe sites. I changed it a bit as I always do. I think it is a lot more fun this way. 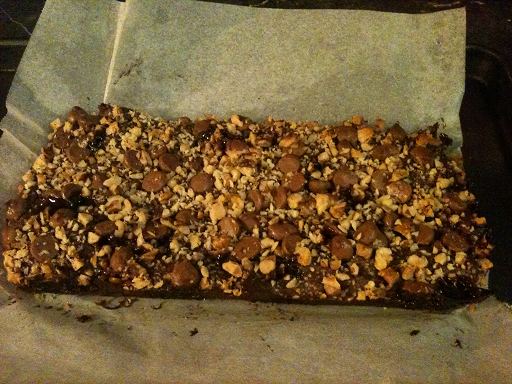 For the topping you can add more chocolate and nuts. Go with your heart! Either way it is going to be delicious. You can never go wrong with chocolate and fudge. This recipe is gluten free, wheat free, grain free and dairy free if you use dairy free chocolate chips. Not always easy to find but when you do stock up! 1. Preheat oven to 180C/350F. Grease and line a loaf tin with baking paper. 2. In a bowl mix together the almond butter, coconut milk, egg, vanilla and salt. Then add the cocoa powder, sugar and choc chips. 3. 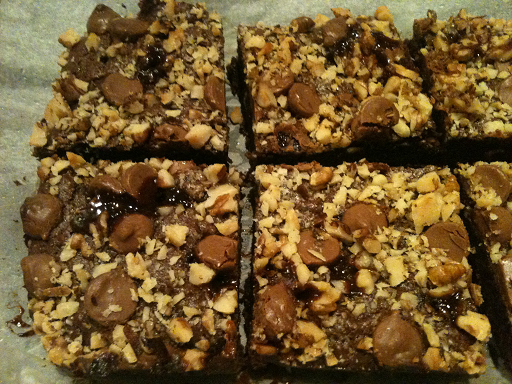 For the topping sprinkle choc chips and nuts over brownie then drizzle with honey. 4. Bake in oven for 25 - 30 minutes. 5. Serve with lactose free vanilla ice-cream. TO. DIE. FOR! Note: It should still be moist in the middle so if you are testing with a toothpick you should get some chocolate on there it shouldn't be dry. If it is you have overcooked it and it's cake not fudge!